An oil platform is a large structure placed in the sea. It is used to drill for oil or natural gas at the bottom of the sea. The platform may be attached to the sea floor (stationary)or it might be movable(mobile). In general, oil platforms are located on the continental shelf. 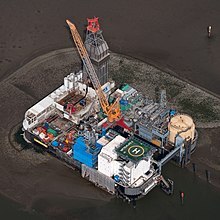 As of 2006, drilling for resources up to 8km away from the platform was possible. This page was last changed on 8 March 2013, at 15:15.